Apparently eight thousand houses around Chatswood, North Ryde, Maroubra and Bexley were left without power for the night. 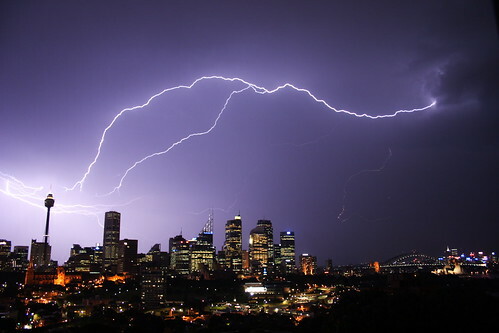 Eleven thousand more homes across Sydney's north-west and west lost power at the height of the storm. This was the trickiest of the lightning shots to get. 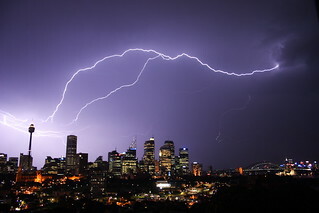 The previous, long exposures of 20-30 seconds odd, easily caught far too much lightning. So I tried to catch a bolt in a 1 second exposure based on the "feel" of an impending strike. After many failures, this was it.